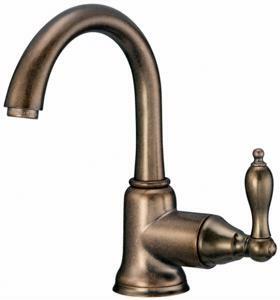 Bronze faucets and other bathroom accessories are popular choices among amateur bathroom remodelers, as they have an uncanny ability to add warmth and depth to living spaces. However, they can be a bit tricky to incorporate into your decorative scheme, so keep the following tips in mind, according to FabulousLiving.com. Your bronze faucets and dials shouldn't be the only source of the hue in the bathroom. Be sure to combine them with similar bathroom accessories like towel racks, towel rings and other small accents. Matching copper light fixtures can also lend a touch of uniformity to the space as well. The wall color will also set the tone for the space, so go with warm and rich hues like pomegranate, cinnamon or paprika. You can then incorporate complementary towels, shower curtains and other small accents to make your bathroom a cozy and comfortable spot at any time of the day. Finally, don't forget an elegant shower curtain rod. A bronze or copper design could be a dynamic finishing touch that pulls your decorative scheme together. What design tips do you have for homeowners who are interested in bronze fixtures?